Kenny Arrived from Liverpool, England in May of 1979. Though Kenny figured he would stay only for the summer, his plans quickly changed after arriving in the States. Kenny was attacked by Cupid's arrow somewhere in the Caribbean and suddenly his resolve to return home disappeared. Now at home in the United States, Kenny serenades, rocks and celebrates with dozens of clients every year in a way only Kenny Cunningham and his british influencers know how! His mellow voice has definitely captured the hearts and ears of his supporters. He is, in fact, one of the sought after acoustic guitar performers across Lower Connecticut through Maryland, Pennsylvania, Atlantic City, and New Jersey. Kenny is often hired as a solo singer-guitarist for weddings. His repertoire, personality, and charisma allow him to connect with his audience. This connection will usually lead to a powerhouse performance from him and an audience that is craving more of his renditions and original music. Music has always been a part of Kenny's life and his main goal is always to be able to imbibe this passion to his clients and share with them his experience and love for his craft. Not one of Kenny's performances is the same. He will always check and collaborate with his event organizers on what his repertoire will be and how it will adapt to the event that he will be performing at. If you want to book his services or if you might have any inquiries, you can send him an email at [email protected] He will gladly respond to them. 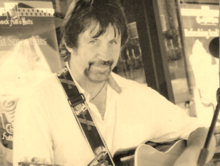 If you are looking for a fun and relaxed night that is going to be filled with good music and laughter, make sure to book Kenny Cunningham's services. He can guarantee that it is going to be a night that your guests will never forget.